Basic ingredients: This well-intentioned cookery school offers bespoke classes, tailoring tuition towards staff away days, client entertainment and private parties. 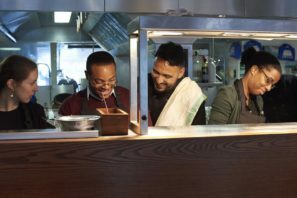 Ambitious cooks can arrange a dinner party, chez Waterhouse, where they will prepare and cook their own menu before sitting to dine with chosen guests, who can judge the results via donations to the Shoreditch Trust. It is the trust’s Food For Life and Blue Marble Training projects that benefit from the cookery school’s proceeds, which means that a class of 12 will fund three community workshops. Blue Marble Training is a culinary scheme which helps 16-25 year olds improve on difficult circumstances through key skills development, pastoral support, guidance, mentoring and work experience. Food For Life tackles obesity in the local Hackney district through practical culinary demonstrations that teach healthy eating on a budget. Waterhouse enlist the Food for Life team to deliver advice on nutrition; the basic premise being that sustained healthy eating starts with fresh seasonal ingredients, cooked from scratch. The school translates this into tasty tucker with recipes inspired by global cuisines. Examples include the herb-packed Persian frittata (kudu sabzi) and pan-fried mackerel with heritage tomato salsa. The serious message is knitted into the fabric of fun, with classes inviting healthy competition through things such as Ready Steady Cook style icebreakers. The school can accommodate groups of up to 24 and classes last around 3.5 hours. A little money goes a long way with the basic £100 per person package providing tuition, nutritional advice, a three-course meal, ½ bottle of wine, a glass of prosecco and a enormous sense of wellbeing. They say: Waterhouse Cookery School is a one of a kind opportunity for team building, bonding and learning new skills. Throw on an apron and get stuck into the chef’s life, preparing delicious, healthy food to share and enjoy when you come together to eat at the end of the day! We say: The Waterhouse way is unfussy and full of affable community spirit backed up by the necessary expertise and guidance when it comes to tuition. Good nutrition is at the heart of what they do but there are plenty of practical culinary disciplines to learn by way of bread making, butchery or fish filleting. As things get technical and the mercury rises, the open-plan kitchen provides a glimpse of the cool, calm dining room overlooking the canal, which lies in wait for the final feast.